The Contak saddle focuses on the safety and experience of the rider and the horse involved, as well as improving the comfort and effectiveness of the volunteer side-walkers. 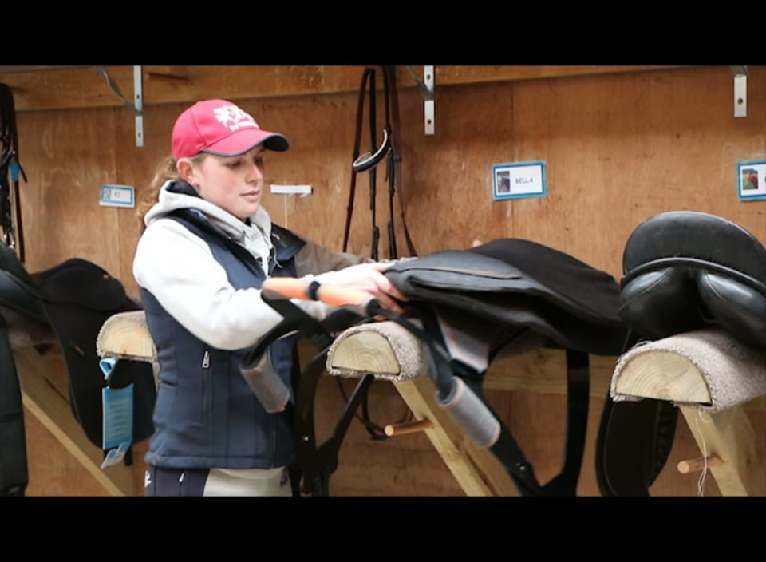 To achieve this, the Contak saddle brings the rider as close as possible to the horse, facilitating neutral joint positions that ensure a comfortable position for all during the ride. As an innovative saddle design, Contak contributes to a refined therapeutic experience that integrates the different usability factors required by the rider, volunteer and horse. Contak draws on traditional saddlery forms but utilises contemporary processes, as well as lightweight, low-maintenance and formable materials to create this specialised saddlery product. This contemporary approach ensures an intimate, unobtrusive and tailored experience. The structural component of the Contak saddle – a high-density polyethylene (HDPE) – has been perforated to facilitate heat transfer and shell flexibility. This allows Contak to offer 60% closer contact between horse and rider compared to currently available equipment, which relaxes and lengthens the rider’s large muscle groups – a particular concern for children affected by physical disabilities where the muscles are tightened or in spasm. The increased surface area of the saddle provides an even distribution of the rider’s weight that ensures the horse’s performance and comfort are not compromised. The importance of a visual connection with the horse is addressed by removing bulk around the rider. Due to the significantly less distance under the rider’s thigh and lower leg, the lower extremities are closer to the midline of the torso and creates greater stability for the rider. Stability and security are further enhanced by the handles which replace traditional reins, and offer grips that move independently and flexibly according to individual needs or desired results. Rider stability is also enhanced by widening the base of support and encouraging a relaxed and neutral joint position of the wrist and forearm. This allows the horse’s movement to be accentuated through the rider’s elbow and shoulder, adding an element of joint exercise. Together the formed HDPE shell and handle frames provide a lightweight, durable and flexible assembly. Additional support during faster-paced therapy sessions can be facilitated by side walkers applying pressure across the rider’s thigh, utilising a dedicated handle. The placement of the sidewalker handle on either side of the saddle encourages a comfortable hold, creating less strain and rotation of the sidewalker’s shoulder, forearm and wrist. Retaining the intuitive nature of existing saddlery, the Contak saddle highlights interaction points through colour and material to ensure it is recognisable and understandable to equestrians. Contrasting felted wool with HDPE offers comfort for the horse and optimises and regulates the heat transfer through a natural material. The aesthetic of Contak complements the contemporary needs and performance requirements of a specialised therapeutic saddle.